out self-expression. 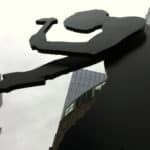 Whether it’s music, food, fashion, or art, Seattle encourages the best and brightest to think and create “outside the box.” Seattle has a variety of art museums; below are five definitely worth visiting. towers 48 feet and represents the working man and woman in all of us. SAM houses a variety of permanent art collections including African, Ancient Mediterranean, Native American, European, Islamic, and much more. The museum is open Wednesday through Sunday and has a gift shop as well as Taste, a small specialty café. There is convenient parking at 3rd and Stewart Street. The Olympic Sculpture Park was opened in 2007 on what was once an industrial site and is part of the Seattle Art Museum. 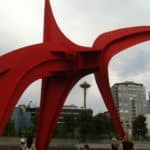 This urban park located on the Seattle waterfront features large outdoor sculptures as well as breathtaking views of the Puget Sound and the Olympic Mountains. It is free and open 365 days a year. On weekends the small café is open and offers a great spot for quick refreshments with a world-class view. The Olympic Sculpture Park is a short 10-minute walk from the Seattle Center and the Space Needle. The Asian Art Museum is located in Volunteer Park on Capitol Hill in the building that housed the original Seattle Art Museum. Presently it is closed for renovation till 2019. This beautiful Art Deco building is a centerpiece of Volunteer Park and has not been substantially renovated since its beginnings in 1933. Updating work is being done to protect the historic building as well as the valuable Asian art collection it contains. Keep this in mind for you’re a future trip to Seattle. Frye Art Museum, located on Terry Street on First Hill, houses a painting and sculpture collection from the 19th century through today. Started with the founding collection of Charles and Emma Frye, this more contemporary museum is free. Along with a unique collection of art, the museum has a number of programs. Children will enjoy Small Frye: Storytelling and Art. Partnership for youth offers free art classes to teens. Bridges and the Alzheimer’s Café are geared toward art positively influencing the lives of those with dementia. Finally, the Henry Art Gallery is located on the University of Washington campus. This museum is known for its contemporary innovative works. It is closed Monday and Tuesday. Entrance is free every Sunday. This museum is great for all ages and lives up to its mission: to advance contemporary art, artists, and ideas.